Rigorously selected herbs are macerated in alcohol and then carefully distilled in small batches. It is by this method the typical scents of Grand and Petite Wormwood, Anise and Fennel Seed, Angelica, Veronica, Melissa and Hyssop enter into Un Peureux. Colored only with additional herbs, this Absinthe has the color the French call "Feuille Mort"(dead leaf). At 48% abv. (96 proof), this seems for this producer, to be the ideal strength, obtaining all herbal aromas, without the Absinthe being overpowered or bitter. Un Peureux further develops when adding cold water, enabling you to detect all the individual herbs. Un Peureux is a solid, fair priced Absinthe for debutantes that also makes a perfect gift - as it comes in a beautiful gift box. 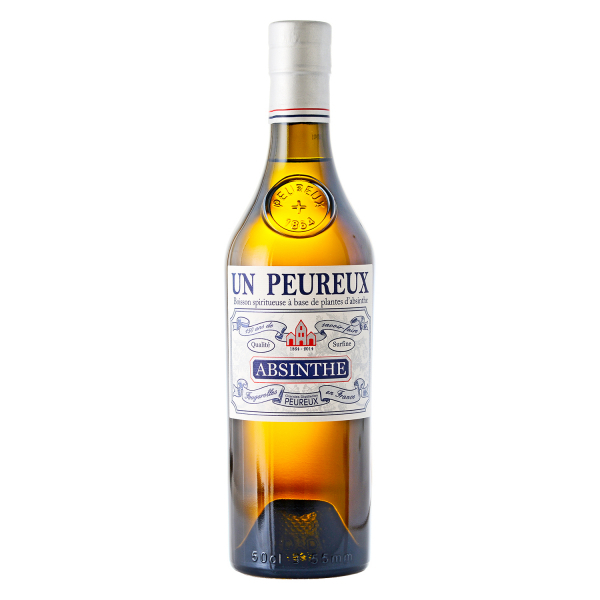 Related links to "Absinthe Un Peureux"
Customer evaluation for "Absinthe Un Peureux"
A pleasant surprise for someone who has tried several real absinthes (i.e. those made in the traditional way with proper ingredients). Un Peureux louches thickly and tastes of anise (a little like the star anise also) and has a non-overwhelming, yet pleasing, aroma of the other absinthe herbs. On the down side is the fact that its taste and mouthfeel do not linger so much as with other absinthes, but this can happen with too strong dilution so it is best to experiment with maybe a little less water than usual. I also like the look of the bottle, label and packaging: it is on one hand traditional but on the other modern also (this is an important thing for first time buyers!). Ob pur oder verdünnt, mit oder ohne Zucker, je nach Laune. Bisher einer meiner absoluten Favoriten. Ich habe mich - da ich tatsächlich ein Neueinsteiger bin - exakt an das empfohlene Mischungsverhältnis gehalten und das Prozedere mit flambiertem Zucker und Eiswasser gewählt. Das volle Aroma hat mich überzeugt. Unangenehm empfand ich allerdings den sehr lagen bitteren Abgang. Wir raten unbedingt davon ab, Absinthe bei der Zubereitung anzuzünden. Die Bittere Note kommt sehr wahrscheinlich vom verbrannten Zucker, denn Un Peureux ist beim besten Willen nicht bitter. Das Glas wurde zwischenzeitlich nachgeliefert - unser Fehler! Sorry!